Birthday Celebration ~ Let There be Cake, Beets, and Potatoes! Last week I celebrated my birthday! (Thank you). While I didn’t get a pony, or a kangaroo for that matter, I did get to celebrate my birthday with family and friends. 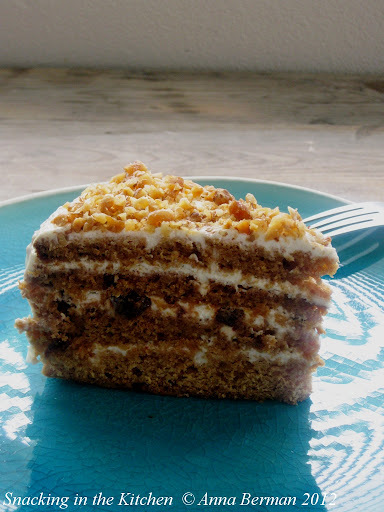 What could be sweeter, except for a slice of my mom’s Honey Cake with Sour Cream Frosting and Toasted Walnuts? Not much. The cake was exactly what I wanted for my special day. In fact, I was sure to request the cake on more than several occasions, weeks before my actual birthday. The cake: layers of honey cake spread with sweet and tangy whipped sour cream and sprinkled with toasted walnuts. The cake stood tall and proud. Since the birthday celebration took place in the evening, the lighting did the cake very little justice. 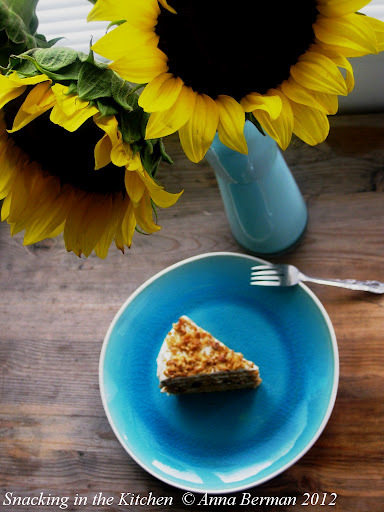 I used this light deficiency as an excuse to ask for an extra slice of cake to take home and photograph. I was a very happy girl the next morning! 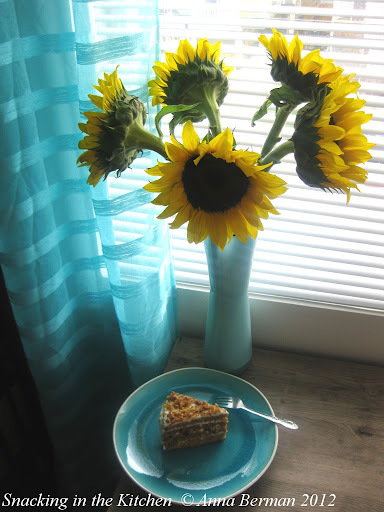 Thank you to my mom for baking this special cake for me and for beautiful sunflowers (scroll down to see those sunny beauties!). I hope one day to get the recipe for this cake and bake it for my own daughter. Curious about the beets and potatoes in the title of the post? Check back in a couple of days for details. I'll be back and I'm expecting some beets! Happy Birthday, by the way. From the sounds of this cake, you've definitely been celebrating. How fantastic!